Marble finds a comfortable home in the bath. Comprised of crystallized, metamorphic rock, marble is a fragile beauty. It is a beauty that must be respected, however, for it has been used throughout time for its great vibrancy and soft elegance. There are many places in the world where marble is quarried, Italy being the most renowned. A marble countertop is a thing of beauty that should be maintained on a regular basis to protect it from harsh elements common in households. The feel of marble is very soft and smooth—a newborn stone. Unlike granite, the pores of marble readily absorb any liquids that rest on its surface. Maintain a clean dry surface when using marble in your in your home. A kitchen countertop will suffer the most abuse of any countertop in your home. This is ultimate reason that low maintenance surfaces are recommended for use in the kitchen and marble is not. Bathrooms, however, suffer less abuse and generally have a smaller areas to maintain. Maintaining a small vanity or ledge in the bath is not a terribly large price to pay for an item that rewards you with such beauty as marble does. 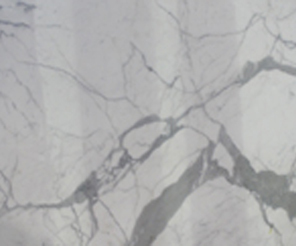 Latitude offers marble for its great beauty. The colours available in our standard collection of marbles are each entry level stones—a great value for surfaces as complimentary as marble. There are, however, numerous unique natural marbles available at various price points.